At some of junction transmission is electrical .the neuron is directly adjacent to other neurons. Small holes in each cell's membrane, called gap junctions, are juxtaposed so that as the action potential reaches the end of the axon (at the terminal boutons), the depolarization continues across the membrane to the postsynaptic neuron directly. at a few conjoint synapses it is both electrical and chemical. The effects of discharge at synaptic endings can excitatory or inhibitory . Transmission from nerve to muscle is chemical transmission.The neuromuscular junction. 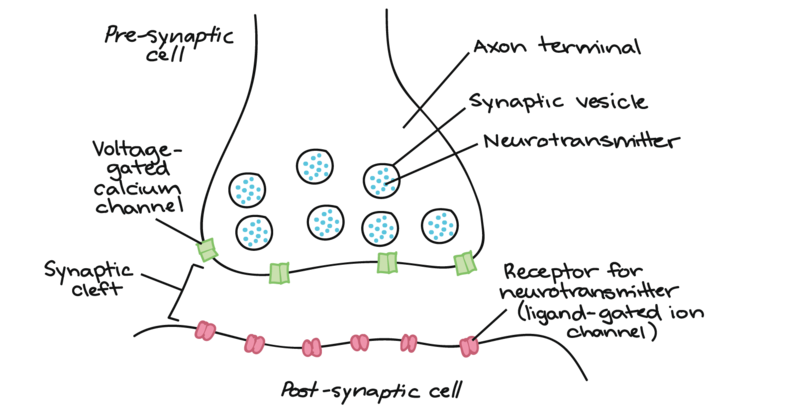 Each presynaptic of chemical synapse is separated from the postsynaptic structure by synaptic cleft that is 20-40nm wide. postsynaptic membranes contain neurotransmitter receptors, and usually a postsynaptic thickening called postsynaptic density, which is complex of specific receptors, binding proteins and enzymes induced by postsynaptic effects. * large vesicle with dense core that contain neuropeptides. ¤ There are areas of the membrane thickening called -active zones - which contain many proteins and rows of calcium channels. 1-When the action potential arrives from the axon, it causes the calcium channels to open, increase the membrane permeability to calcium. 2-The intracellular calcium attract the vesicles to fuse with membrane and release their contents by exocytosis. 3-The released transmitter diffuses into the synaptic cleft and combine with specific receptors for that transmitter on the postsynaptic membrane. 4- the change the permeability of the postsynaptic membrane to specific ions and results in postsynaptic potential. * If this potential is depolarized and reach the membrane threshold level, an AP results..
- Depending on the type of synapse or transmitter, the potential can be excitatory or inhibitory. -Single post synaptic potentials (PSPs) do not usually cause any excitation or inhibition in postsynaptic neuron because the change membrane potentials does not reach the threshold to produce a response, but they may prouduce partial depolarization or hyperpolarization . threshold is reached by spatial or temporal summation and can be excitatory or inhibitory . If one synaptic knob is repetitively stimulated, its postsynaptic local may add up and reach threshold to fire an action potentiall.